This article by Dave Beck, Postdoctoral Teaching Fellow, Bangor University is republished from The Conversation under a Creative Commons license. Read the original article. I was one of 58 academics, activists and food writers who published a stark open letter warning against food banks becoming institutionalised in the UK. We believe the country is now reaching a point where “left behind people” and retailers’ “leftover food” share a symbiotic relationship. Food banks are becoming embedded within welfare provision, fuelled by corporate involvement and ultimately creating an industry of poverty. We advocate challenging this link between food waste and food poverty. The UK has a welfare system that should be there for people in their time of need. But instead food banks – of which there are now roughly 3,000 across the country – are in receipt of government subsidies supporting redistribution, and fresh food is being introduced through publicly funded corporate philanthropy. While people are certainly being helped by food banks in their moments of need, we cannot accept that they solve long-term poverty. In the US and Canada, academic Andy Fisher has highlighted that food bank institutionalisation has been politically and corporately encouraged over the last 35 years, but this has done nothing to alleviate food poverty. It has, in fact, only served corporate interest and entrenched food poverty further. For my PhD research I looked into the rise of food banks and critically examined their role as a new and emerging provider of aid for people struggling with welfare reform. My work also assessed the structural causes of food poverty associated with the Welfare Reform Act 2012, and the changing language of social security. Austerity policies provided the initial fertile ground which led to many more people needing to access food banks. Under welfare reform, access to welfare became subject to heavy conditions. People came under heightened sanctions if they failed to follow their claimant commitment, while the so-called bedroom tax saw some losing housing benefit entitlement if they had a spare bedroom in their council or housing association-owned property. This paved the way for food banks to fill the void left behind by retrenched welfare. Now food banks are increasingly accepting large donations and working with big retailers and food redistribution organisations, as they become an accepted part of UK life. For food banks to become part of an institutionalised provision, leading food poverty expert Graham Riches argues that there is a three-stage process. First, there needs to be a national food bank provider, for example Feeding America in the US, and Food Banks Canada. These organisations coordinate and support linked food pantries under their banner. Within the UK, the Trussell Trust, with a strong network of 427 foodbanks (plus associated distribution centres), has a similar role. Second, this national provider must create partnership alliances with food companies and food redistribution organisations. For the last seven years, the Trussell Trust has worked with UK food retailer Tesco. 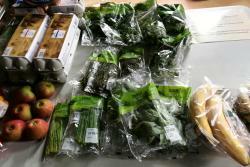 Recently, it has also collaborated with Fareshare and Asda to increase redistribution to its food banks. Contacted by The Conversation for this article, the Trussell Trust insists it is “campaigning to create a future without food banks”. Emma Revie, chief executive, highlighted its role in campaigning for changes to the benefits system to properly support people who need help. She added there was no desire for food banks to “become the new normal”. But the engagement of retail giants serves to embed food banks, as it combines two socially distinct problems – food surplus and food poverty – while doing nothing to solve the structural issues of poverty. It serves the retailer well too, by improving their corporate social responsibility (large retailers are seen to be acting for the social good of their community), not to mention the increase in sales through their tills. Shoppers are purchasing their donations from these retailers and putting them in store donation bins to be taken to the food banks. The third stage is an increasing influence and relationship with national government. A national food bank provider can then emerge as an accepted response to declining welfare. This has happened in the US and Canada, although UK food banks at present are still in a campaigning position. Food Banks do not generally accept fresh foodsHowever, I think that food banks also need to complete two more stages for there to be complete institutionalisation. Through their partnership with larger organisations, food banks recognise the need to invest in facilities and transport to deal with redistributed food, especially if it includes fresh food. They also begin to invest in time and energy from dedicated volunteers who make food banks warm and welcoming places. This is common now in North America and has also already begun in the UK, potentially creating an air of permanence about them. Fifth and finally, when food banks are truly institutionalised we will see them accepted by society as being an adequate substitute for welfare, especially for “less deserving” people. This recognition was evidenced when Asda removed all unmanned food bank collection baskets in February 2016, signalling the end of customers’ donations. Following a social media uproar, and a challenge put forward by the charities affected, Asda reinstated the baskets. 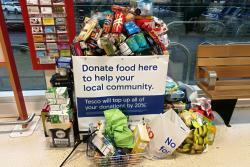 Food bank collection baskets in supermarkets are now commonplace. Their removal and subsequent disquiet shows how there is social acceptance of food banks. People realise the value of them for those in need, fuelling the process of embedding food banks, not just within society, but within our social conscience. But we need to remember that food poverty has no place within our society. We should be campaigning for change, not acceptance of a new normal. As the US and Canada have seen, once food banks become embedded, they do not go away. Food banks may be vital in times of crisis, but they are not a substitute for proper support.